Incorporating online video recommendation functions into our products was a major challenge for our development team. Amazon SageMaker greatly simplifies the building, training, and deployment of machine learning systems, allowing us to build a full system from the ground up and cope with rising user traffic in merely three months. Shenzhen Dayu Wuxian Technology Co., Ltd. (“Mobiuspace”), founded at the start of 2016, is a startup specializing in the development of mobile applications and now serves one hundred million users worldwide each month. Most of its team members are graduates of top universities including Peking University, Hong Kong University of Science and Technology, UCLA, and Emory University, and have worked at leading internet companies. Mobiuspace primarily provides mobile short video services to emerging markets in the Middle East, Southeast Asia, and Latin America. Its first and top priority following founding was developing new markets and achieving rapid growth, which came with a string of challenges. The first was the sharp shortage of developers in view of the aggressive growth target. Mobiuspace’s mobile short video service is built partly on its video recommendation functions, which require a machine learning system whose exceedingly complex building process – entailing architecture design, creation of training models, selection of algorithms and frameworks, final deployment to the production system and more – demands a sizeable IT team and ample lead time. The second challenge was the need for a cloud platform that provides full coverage of the company’s target markets in the Middle East, Southeast Asia, and Latin America and delivers stable connectivity. The third was finding a solution that minimizes the upkeep workload and reduces the overall system cost. After analyzing and comparing the mainstream cloud platforms on the market, Mobiuspace went with AWS. Upon moving its complete business system to the AWS cloud, Mobiuspace was able to quickly build and deploy its video recommendation system using AWS’ wide array of cloud-based machine learning services, hitting its dual target of achieving rapid startup and delivering quality short video services to users. With its industry-recognized development and deployment services, global reach, and flexible billing methods, AWS matches well with Mobiuspace’s IT infrastructure needs. Mobiuspace has made AI-powered video distribution system its core business and to create a good user experience, it needs to solve two problems: recommending videos based on users’ personal taste and filtering inappropriate contents, both of which require developers who have vast expertise in machine learning. 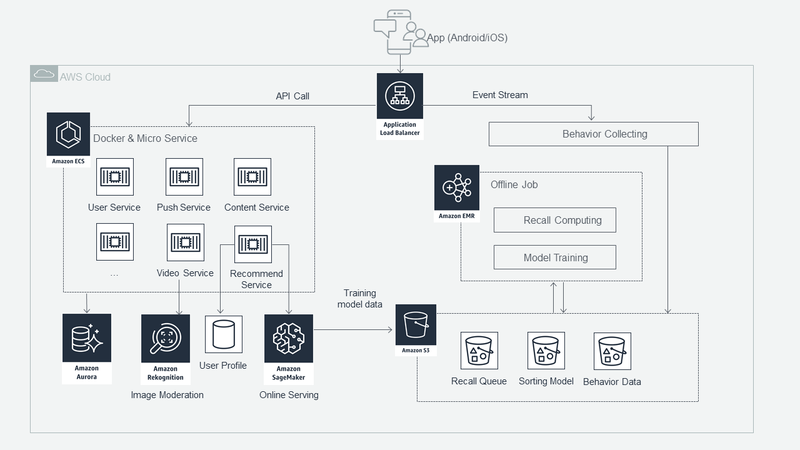 Amazon SageMaker and Amazon Rekognition, available on AWS cloud, significantly simplify the large-scale initiatives to build, train, and deploy machine learning models, enabling Mobiuspace’s IT team to quickly solve those problems. Amazon SageMaker is a fully managed service that helps developers and data scientists build, train, and deploy machine learning models with less effort and time. It can quickly connect to training data, permitting users to easily build learning models and complete pre-training routines. Moreover, the service comes with optimized, commonly used machine learning algorithms, saving users the considerable amount of time they would have spent on choosing algorithms and frameworks. Training a custom-built model is as simple as a single click in the Amazon SageMaker console; after training and tuning, the models can be directly deployed to a production environment through Amazon SageMaker. “We developed our online recommendation system from scratch; it would have taken us half of a year to do so without Amazon SageMaker. Freed from building infrastructure ourselves, our algorithm engineers only needed to prepare the data to be fed into Amazon SageMaker. This has allowed us to build the full system from the ground up and cope with rising user traffic in merely three months,” said Liu Kedong, Vice President of Technology of Mobiuspace. Amazon Rekognition has played a key role in filtering inappropriate videos. Built on the proven, highly scalable deep learning technologies developed by Amazon’s computer vision scientists, Amazon Rekognition can analyze billions of images and videos daily without the input of a machine learning expert. Users just need to upload an image or video to the Rekognition API, and the service will quickly identify the objects, people, text, scenes, and activities, as well as detect any inappropriate content. The service is continually trained on new data to expand its ability to recognize objects, scenes, and activities to improve accuracy. Amazon Rekognition has helped Mobiuspace’s video upload and moderation system to easily perform pre-release reviews and to automatically filter about 97% of inappropriate videos. “Without Amazon Rekognition, we would have to have more people, and therefore higher cost, to perform content review,” added Liu. Mobiuspace currently deploys its entire business system on AWS, consisting of three major components: First, an online service system which handles requests from Android / iOS devices and the web for all company products, encompassing user center, video feed and channel recommendation, subscription lists, video encoding and decoding, URL shortening and sharing, notifications, and upgrade services. Second, a big data system for collecting behavioral data from client systems and providing the original data to the analysis and recommendation system; it processes billions of events each day. Third, the video recommendation system, which combines Amazon EMR with Amazon SageMaker to process data and train models to produce personalized recommendations, and calls Amazon Rekognition to automatically review hundreds of thousands of new video thumbnails a day. At present, Mobiuspace uses Amazon Elastic Compute Cloud (Amazon EC2), Amazon Simple Storage Service (Amazon S3), Amazon Rekognition, Amazon SageMaker, Amazon EMR, Amazon CloudWatch, Amazon DynamoDB, Amazon Relational Database Service (Amazon RDS), Amazon RedShift, Amazon Kinesis, Amazon Elastic Container Registry (Amazon ECR), AWS Data Transfer, and AWS Support. Figure 1 shows the architecture of Mobiuspace on AWS. Choosing AWS cloud has greatly benefited Mobiuspace in more ways than one. In development, AWS’ extensive range of development and deployment tools means major savings by Mobiuspace in infrastructure investment; the comprehensive and timely technical support from AWS Support has also helped the company’s IT team to promptly resolve the latest technical problems and accelerate product iteration – Mobiuspace has shortened the delivery timeline of new versions of products to within two weeks. Additionally, Amazon SageMaker, Amazon Rekognition, and other intelligent services have enabled Mobiuspace to automate video review and recommendation and thus the delivery of stable, reliable, and superior video services. In system maintenance, Mobiuspace is able to cut cost by deploying some 600 Amazon EC2 instances, which are automated by AWS and require no dedicated maintenance staff. In operation, AWS’ global coverage has allowed Mobiuspace to deliver high-quality video services to users, whether they are in the Middle East, Latin America, or Southeast Asia. Lastly, in the use of computing resources, because AWS offers different billing methods for Reserved Instances, On-Demand Instances, and Spot Instances, Mobiuspace can optimize its use of AWS cloud resources according to business needs, allowing it to both grow the company and reduce the overall cost. To learn more about how AWS meets your need in building mobile applications, visit AWS Amplify for details. To learn more about how AWS putting machine learning in the hands of every developer, visit Machine Learning on AWS for details.